Lately, when meeting people I’ve started to see their faces clearer, more specifically the difference in the color of their eyes. 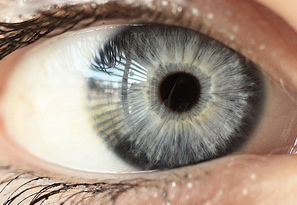 Why is it that our eyes give off various colors? It turns out that it has to do with how much melanin is in your iris, in relation to white collagen fibers. This can produce several shades of colors like grey, green and hazel. So if light travels through a melanin-free iris, collagen fibers within the iris disperse the specific color of light to the surface of the iris expressing that same color being let through. It is also important to note that eye color is a combination of genes working together to create it’s color, instead of one gene assuming the role. Genes known as OCA2 as well as HERC2 are the two main ones. HERC2’s job is to manage the OCA2 genes’ process. A European study that was done expressed, “a common polymorphism in HERC2 gene is responsible for the blue eye phenotype. A person who has two copies of C allele at HERC2 rs1293832 will likely have blue eyes while homozygous TT predicts likely brown eyes.” The same experiment showed SNPs (single-nucleotide polymorphisms) found in OCA2-HERC2, SLC24A4, SLC45A2, TYR and IRF4 could be used as determinants for what color the eyes will end up being. In conclusion of this experiment, chances of brown eyes were 93%, whereas chances of blue eyes was 91% and 72% for two colored eye appearance. Eye color also has to do with the genes inherited from the chromosome mixture that we received from our parents. Within the genes are alleles that determine the likelihood of inheriting a dominant or recessive attribute from our mother or father. It is said that there is a greater chance of obtaining green over blue alleles, where brown alleles are even stronger to come into then both blue and green alleles. There is also a relationship that the more melanin that is let through the iris, the darker the shade of color it will be. That is why some people seem to have an alteration in eye color depending on the kind of lighting they are in. I came across a site dedicated to the eye and written with firsthand knowledge from eye doctors. On this page, they discuss that it is more common for white children to be born with blue eyes, but as they start to grow the melanin production starts to increase transitioning to a more set eye color. When a person has blue eyes, they come from a ethnic background of American, Irish, and Northern European, but as of recent a fall has occurred with the now remaining newborn population having only 30% blue eyes. Opposite can be said about those with brown, amber, or hazel type eye color. Roughly 90% of the world population, has either one of these three colors. This entry was posted in Uncategorized on September 18, 2015 by zrl5024. This post is so interesting because the first thing I notice about someone is their eye color! Did you know that the rarest eye color is green? This blog was so interesting because the first thing I notice about someone are their eyes. I always am so fascinated by the different colors a person could have, whether it be brown, blue, green, hazel, and how they ended up with that eye color. Here is a link to what the rarest eye color is.